India is regarded as the leading milk producer in the world. It has achieved this accreditation due to its potential to produce a large quantity of milk which surpasses the level of milk production of other countries. If we analyze the statistics, it denotes that India produced a total of 155.5 MT of milk in the financial year 2015-16 which alone constitutes to 18.5% of world total milk production. The per capita availability of milk in India has also increased considerably which is now 337gms per day. The country owes this accomplishment to the dairy farmers who foster the cattle and contribute to the development of DairyIndustry in India. There are also several factors like dairy farming techniques and practices that affect the overall milk production. Also, the dairy farming business is safe and reliable in India. Let’s walk through the attributes that contribute to the continued success of dairy business in India. Dairy farming consumes less energy with the utilisation of cow dung. It is fed to the Biogas plant to generate renewable energy and also used as organic manure in the farms. The usage of such renewable energy makes dairy farming eco-friendly and causes less pollution as compared to the other industrial sectors. Skilled labour is not a necessity in dairy farming here. A farmer holding even the basic knowledge of dairy farming can also efficiently raise the cattle. The dairy market in India never subsides. It remains as active all through the year. Various resources and raw materials required in dairy farming are available almost all the time which minimises the requirement to invest in inventory. Like humans, the animals can also be insured which plays helpful in case of loss of cattle for some or the other reasons. The entire setup can be moved to other location under any severe emergencies or circumstances if required. There are still certain areas where India lags behind and finds a scope of improvement in dairy farming. The following is recorded a share of motivation to why there is a requirement to dispel the shortcomings and move towards further expansion of dairy industry. Breeding and getting expected milk output are both biological and depend on various natural or unnatural factors. Lack of adequate infrastructure, improper management of feed, cattle health, and lack of quality control affect the overall production which causes significant loss of profits of the entire business. 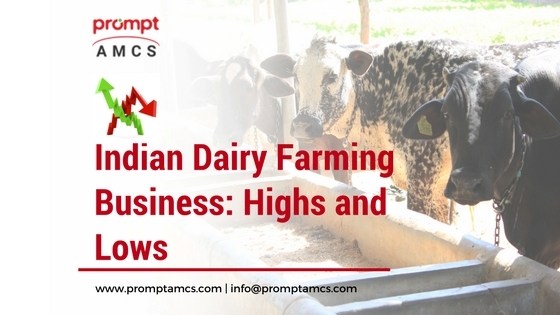 The dairy farms need appropriate managers to look after the farms, cattle and overall management which is a shortcoming in India as the supervisors employed for the same are usually among the family members. There’s no argument against the fact that the Indian Dairy Industry is scaling the mountains. There are factors contributing to its growth on one side and a few drawbacks that the dairy industry needs to work upon on the contrary. The government has also played a vital role in releasing various schemes and policies in favour of the dairy farmers. But just a few have been implemented by far. There’s a necessity that the benefits of these government policies reach the farmers which will ultimately boost the milk production in India, and hence the growth of the dairy industry.